SQL Tact: SSRS 2016 then SQL Jeopardy! tonight at BRSSUG! SSRS 2016 then SQL Jeopardy! tonight at BRSSUG! 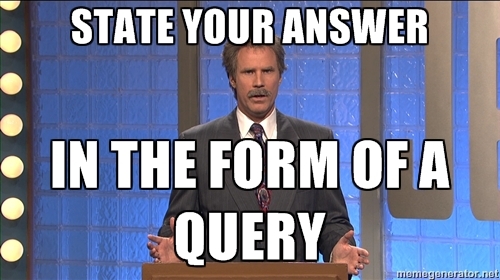 See you tonight for our special SQL Jeopardy! competition where I will be your Trebek and three lucky user group participants will be our contestants! Also a "special appearance" by our BRSSUG founder and Microsoft architect Patrick Leblanc, who will do a lightning round presentation on What's New in SSRS 2016. William Assaf, MCSE, is a SQL Server Consultant in Baton Rouge, LA, chair of the Baton Rouge SQLSaturday planning committee, leadership of Baton Rouge SQL Server User Group, PASS Regional Mentor for the South Central region. Read me on the Sparkhound Blog! Watch me on UserGroups.TV! Distribution setup SQL Server Agent error: "RegCreateKeyEx() returned error 5, 'Access is denied.'" "The attempt to add a row to the Data Flow task buffer failed with error code 0xC0047020."